Capadia Designs: Happy Memorial Day! I hope you all had a lovely weekend - our weather here in the Boston area was just perfect today! Sunny and a bit on the cool side - ideal for a cook out. We had most of the local extended family members over for the afternoon. It was fun to have all the kids here - including the triplets! It was a very busy day, but, after everyone left, I did have a chance to sit down and do my page for this week's digital challenge at FCTSC. I used nine photos from our family vacation in February, 2008. 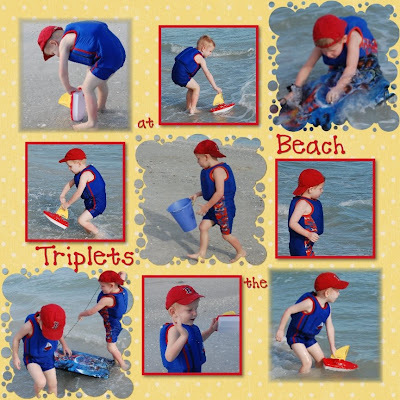 The boys had so much fun playing at the beach at Sanibel Island - these are just a few of the many photos I took during the week. I set up photo spots in three sizes and dropped in various beach photos, zooming them to fit the spaces neatly. I used a bright yellow background paper and added the title in red to match the Red Sox hats the boys were wearing. The font is called "Katie." I added the "bubble" edge to the three largest photos on the diagonal, matted the four smallest in the same color as the font and added a heavy shadow. Then I added a blur edge to the top left and bottom right photos with a light shadow. This was the first version of the page that I saved but I decided to go back to my original concept of putting one word in each of the "gaps" betwen the photo groupings. I may change my mind again - which is one of the great features of digital - nothing is final until you decide it is ready to print! VERY cute! You have a wonderful talent. The boys are darling, of course I'm sure they are much bigger now and ready for another Sanibel vacation. AWWWW These are too cute. Love the colors you used. Great LO.